It’s a dull December day here in Yorkshire. There’s a cold rain, and even though the sky has barely lightened all day, I just know it will be getting dark again soon. 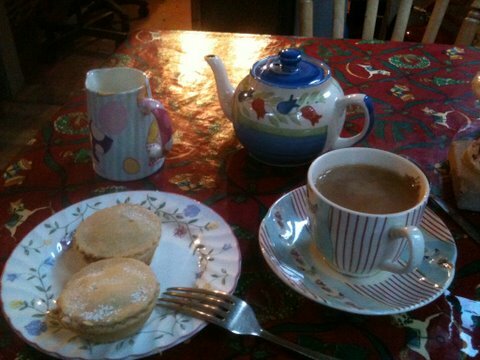 Tea and mince pies – delicious! Where do you live, Gemma? I grew up on an island in the Caribbean with trips to Ireland. Later I lived in several European countries. I’ve called Texas in the USA home for seventeen years and have lived in the Dallas Ft. Worth metroplex for nearly eight years. The Caribbean and Ireland – that really is the best of both worlds! I probably should have been an adventurer as there are dozens of such places on my list! I love the west coast of Ireland, too, Gemma. There’s something magical about looking out on the wild Atlantic. Being a writer is a great job. What’s the worst job you’ve ever had? I’ve been lucky in the way of jobs. I haven’t had a really terrible job. The job I least enjoy is book keeping, and for the past decade I am the one responsible for ours. What book do you wish you’d written? I can never choose just one of anything, I hope you understand! Oh I love M.M. Kaye! You have spurred me to reread her novels. In my microcosm, my father, Julian. I’d tell him how much I miss him and his laughter. In the macrocosm, I’d like to sit with Vivian of the Lake and Merlin and get the true story. I’d like to ask Nelson Mandela, Mohandas Karamchand “Mahatma” Gandhi, and Mother Theresa how it feels on a soul level to leave this earth having used peaceful means to accomplish so much for so many. There would be a collection of powerful spirits at your meeting! What’s your happiest childhood memory? My father and I zipping along on a speed boat, with me perched on the bow, legs hanging over the front, racing into the wind, surrounded only by sea and sky. Then anchoring at a tiny island where I’d dive into the shallow water and snorkel. We did this almost every weekend for years. That just sounds fabulous! What glorious memories to take with you. If you had to marry a fictional character, from film, television, or books, who would it be? William Wallace as depicted in Braveheart – not Mel Gibson! Self-sacrificing strength of character and fierce loyalty to his clan – that’d be my ideal fictional husband. I must say, though, I’m very happy with my ordinary larger-than-life hero of a husband! What’s the most important lesson life has taught you? It’s not enough to be patient ~ learn to enjoy the wait and the process. Delight in the anticipation of what you wish for. Life is all about the journey, not the destination. In fact, there is no ultimate destination. Each moment is what counts so live in the now – not the past or future. And finally, please tell us about your latest book, where we can find it, and where we can find your blog/website! I wrote a novella as a tribute to autumn, my favorite season of the year. 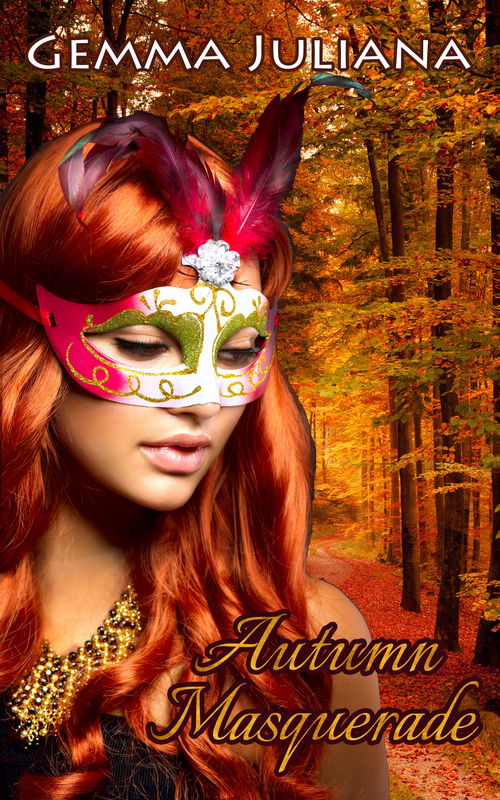 Autumn Masquerade deals with love and loss, rejection and healing. When a corporate executive exposes her secret psychic gifts at an autumn masquerade ball, will her handsome boss – a widower – judge her? When Richard’s deceased wife insists she has a message for him, Anna fears he’ll see her as manipulative. She buried her psychic abilities long ago because they brought rejection. Now she is a rising star in her career with deep feelings for her boss, and has so much to lose. My Christmas novella is Christmas Spirits. This is a ghost love story that transcends time. It takes place in an ancient Irish castle ~ Winterthorne. While younger generations of the royal family gather for Christmas, a bride who died too young returns to spend one last Christmas Eve and Christmas with her beloved husband. She has visited him faithfully every year as promised, but this will be the last time. She made a pact – a physical body in exchange for giving up all future visits. Will she be able to convince her husband to leave with her when her time ends? The Sheikh’s Crowning is the latest novella in The Sheikhs of the Golden Triangle series. It’s the story of Princess Yasmine and her very non-royal Rick Green. How can a widowed princess who fears loss fall in love with a man whose job is rife with danger? How can an ordinary all-American man fall in love with a wealthy and powerful princess? Amidst political and illicit intrigues, these two learn to overcome imagined limitations so they can find happiness. Thanks so very much for having me visit today, Helena. I toast you and your readers with a cup of hot chocolate, and wish everyone a memorable and peaceful holiday season! Happy reading! Happy reading, Gemma! And thanks for cheering me up on this dull winter day! If you have any questions or comments for Gemma, please let us know. We’d love to hear from you! Helena, please pass a mince pie to me, and I need a bit of sugar in my Earl Grey. Did you take that photo of the pies and tea? Yummy…Gemma, what a delightful interview. You have a wonderful spirit within you as evidenced by your choices of the people you would like to meet. Wishing you continued success in your writing career. I look forward to reading the stories you ladies have contributed to the anthology. Hi JQ, thanks for dropping by! The photo is from a local cafe. (Sadly not my tea set!) Help yourself to mince pies, though, and thanks for your great comment! Hi Helena, what a lovely tea you set up for our chat. Thanks so much for having me today. I’ll be stopping in throughout the day to meet your dear readers. Hi J.Q. Rose, Thanks for stopping in for tea and a mince pie today. My favorite tea is Earl Grey as well. Helena has done such a beautiful presentation on this interview, I’m delighted with it. 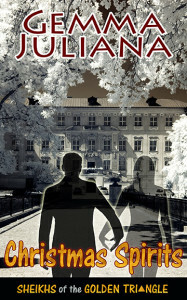 I’m sure you will enjoy the anthology ~ Helena’s story Fallen In Love is a wonderful read, as are all the stories. Happy Holidays! Thanks for your comment, Rose. I understand what you mean about the fingertips and toes tingling at certain sights. I’d love to visit the Midwest, too, some day! Hi Rose, I’m in Michigan. I’m curious to discover the labyrinth location. I’d like some tingles in fingers and toes and not from freezing weather! Hi Rose, Nothing would please me more than to tingle in your labyrinth and soak up the energy of your standing stones! Thanks for stopping in for tea, it’s always a delight to visit with you. Hi Tina, thanks so much for downloading our anthology. I enjoyed Gemma’s story – I thought the train journey through a snowy landscape was a great idea. Hope you find time for lots of reading over the holidays! Thanks for coming by! Hi Tina, This is the first anthology I’ve participated in, and it’s so much fun. When I read the stories of the other authors, the blending of it increases the value of each story, in my opinion. Like the whole being greater than the sum of its parts. Thanks for visiting today. Gemma, I’m a neighbor on the west side of Fort Worth. Y’all in Dallas got the worst with the power outages, but we got the worst with ice on streets. Love your answers, especially the folks you’d visit with. And Fall is my favorite season, too. I’ll definitely be checking out that book. Great cover, BTW. Now I must check whether I’ve downloaded the anthology. Think I have, but I swear between the ice and working with DH on edits for second book, I don’t know which day of the week it is. Lovely time, ladies. I’ll FB and Tweet. Mincemeat cookies! Now II’ve never heard of them and I’m intrigued! They sound delicious. We really must organise a recipe swap in the New Year, because you always whet my appetite. Thanks so much for coming by, and for your support. Lovely comment! Hi Marsha, How lovely to have you stop in for tea! We are literally neighbors indeed as I’m closer to FW than Dallas. The weather has been a real challenge here this past week, but I must confess I’ve enjoyed it. Except for taking walks, I stayed home for five days and hibernated. Baked cookies, hung tons of colored lights on paintings, cooked a big pot of chili, wrote, critiqued and enjoyed LOTS of hot chocolate and an occasional glass of Merlot. You’ll love the short stories in the anthology – such a diverse range of styles and genres and they all go well together. Happy Holidays! We couldn’t go walk, Gemma. Our driveway and the front of our street, thanks to our trees, which I normally love, kept what sun we had from warming up the asphalt. Sunday and yesterday DH and I got out and attacked the ice. I hacked it with a hoe and he shoveled. We drove out late yesterday afternoon for Mexican food. Ice or no ice, I gotta get my weekly quota of that. But this morning, he slipped down going for the newspaper. (First one that’s come on time since Thursday morning.) He’s okay, but you know, any fall can be a bad one. I refrained from baking cookies, but made lots of soups and edited. Merlot rather than hot chocolate for me. LOL We’ll have to get together in the new year. Great interview! You certainly have lived lots of places, Gemma. I’m sure that helps with your writing. Fall is also my favorite season. Lovely covers! Hi Brenna! So good of you to stop by at Helena’s cafe. Thanks for the cover compliments. My son will be delighted for the feedback. Marsha, I would also love that mince cookie recipe. What a creative idea! Thank you for a lovely interview. I would have loved a cup of tea and one of those mince pies. It took me years to get to like them after I came to live in England but now I’m hooked! Gemma, you must have had a wonderful childhood! Your stories sound fascinating. Thanks, Marie. When I was a child, I always thought mincemeat was literally meat, and didn’t want to touch them. When my mother gave me no more choices one year, I made up for lost time! So glad you stopped by today. Hi Marie, I’m glad you persevered with the mince pies! But even English people don’t always like them – my daughter can’t abide them for example :) And like Gemma, as a child I could never understand why it was called mincemeat, when there was no meat in it! Thanks so much for coming by, and Joyeux Noel to you and your family! Thanks for stopping by Jerri! Lovely interview, Helena. Gemma, I enjoyed getting to know more about you. Thanks so much, Linda. And thanks for your support, as always! It’s lovely to see you here, Linda. Thanks for stopping by! Hi vb, I think I have seen you on the loops – Vicki, right? I didn’t know we are practically neighbors! Thanks for the congratulations and for stopping by for tea. M.M Kaye’s books satisfied a travel and adventure passion and have remained with me all these years. It’s time to read them again! It’s wonderful to get to know you better Gemma. You’ve been most fortunate to have lived in so many places. I’m jealous! Good luck with your books and I hope you get to visit your two facinating places. Gemma, The Mists of Avalon is my favorite book. I reread it roughly every other winter season, and I get something new out of it each time. I think I’m on my 6th time through it. Gemma, what an exciting upbringing you had. I learned so much about you in this interview. I, too, love M.M.Kaye. I love your Sheiks of the Golden Triangle series and I loved your story in the Holiday Anthology. What a terrific interview. Best of luck with your books. Oh, Kaye, you inspire me. I haven’t read my favorites in a long time, but I’m going to do so now. I don’t know about you, but when I read The Mists of Avalon the first time I just knew it was my personal story. Did you feel that way too? Thanks so much for stopping by today! Helena, I think our tea party is over. What a delightful hostess you have been. Thanks again for having me visit today. It’s one of the most enjoyable blog visits I’ve had so far. Take care and have a lovely Christmas by the sea. Thanks, Gemma! It’s been lovely chatting and getting to know you. Thanks also to everyone who joined the party! :) It’s been really good fun, and cheered me up on a dark December day. Have alovely holiday, wherever you live! Late to the tea party but just wanted to say how much I enjoyed reading more about you, Gemma – great interview, ladies! Thanks for coming, Ros – there’s always more tea in the pot!